Applied Blast Hose Couplings are designed from premium grade materials and will provide the operator with an extremely long lasting product. The fittings lock perfectly together providing a secure join between the couplings. We supply a variety of different size couplings; both in nylon or bronze, their design with raised internal rings prevent any air leakage during operation. 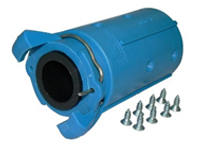 Our quick is connect couplings attach to the Applied blast hose with a series of screws penetrating the other layer of the blast hose without penetrating the inner casing. During operation, the pressure inside the hose ensures a tight seal. Our couplings feature spiral ribs that also aid towards a seal between the coupling and blast hose for increased safety. Built in lock springs on the couplings keeps the couplings securely connected without risk of accidental disconnection. 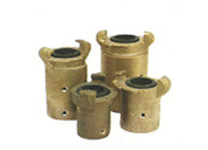 The Applied Nylon Hose Couplings are designed for coupling blast hoses together or attaching the hose to the blast pot. 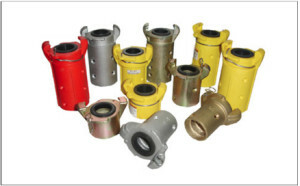 The Applied metal hose couplings come are manufactured from robust, sand cast construction and can withstand harsh working environments. 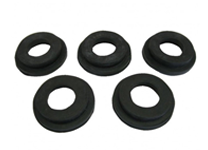 Blast coupling gaskets and locking pins are available in a variety of sizes and designed to be located within the pot and hose coupling.